Following the recent split of Western from Thick-billed Grasswren, the June 2012 Southern Birding Services Grasswren tour included this species for the first time. The tour took 8 participants in two 4WD vehicles up the Birdsville track. The tour was guided by Peter Waanders, assisted by Helga Kieskamp. A total of 148 species were seen (very few waterbirds), including all Grasswrens (though fog prevented good views of Short-tailed). After picking up 8 participants from Adelaide the afternoon before, and driving to Waikerie for the night, we set off early to Birdlife Australia’s Gluepot Reserve. It was a cold, overcast morning and the birds took some time to become active but after a while we were looking at a Southern Scrubrobin singing from a bare branch. Its partner was foraging on the ground below. A very inquisitive family of Emu amused us and a Chestnut Quail-thrush was heard singing, and located with some effort, after which great views of a pair were had by all. Other birds present included White-fronted Honeyeater, Gilbert’s Whistler, Mulga Parrot, Spotted and Striated Pardalote, 7 species of Honeyeater, White-browed and Chestnut-crowned babblers, Restless Flycatcher, Red-capped and Hooded Robins. After a successful first stop we set off in search of our first Grasswren species: Striated. These ground-dwelling birds inhabit large patches of the spiky spinifex grass. At the first site we tried one was heard briefly, but disappeared without a trace. To make up for that we had great views of Shy Heathwren, proving not shy at all. We checked another large patch of spinifex where we soon heard, then saw, a Striated Grasswren. To everyone’s great delight, two birds came in at very close range – about 2 metres – while two other birds were active in the background. After this great success it was time for lunch. There was a brief rain shower on the way to the picnic table but otherwise the weather was still cool (12C) and cloudy. After lunch we searched a nearby Black Oak (Casuarina) woodland for White-browed Treecreeper and found a very obliging pair of these birds which reach the southern limit of their range here. A long drive to the other end of the reserve was required to finally find Black-eared Miners. This sensitive species, which is confined to old-growth dense Mallee eucalypt scrub, hybridises readily with the more aggressive Yellow-throated Miner, a bird of open country and agricultural lands. We found a flock of some 30 birds which after carefully working through the individuals yielded a number of Black-eared Miners as well as some hybrids. Later in the afternoon we spotted an Australian Hobby which provided great scope views en then entertained us all by chasing a Tree Martin. On the way out of Gluepot a small group of Blue Bonnets were seen, and further along the road Regent Parrots. We then had an uneventful drive to Hawker, at the base of the Flinders Ranges, where we had dinner and spent the night. We departed while it was still dark, driving slowly so as to avoid hitting any kangaroos on the road. As it slowly became light (if you could call it that) it appeared that the weather was abysmal. The Flinders Ranges, otherwise spectacularly scenic, were blanketed in thick fog and low cloud produced occasional drizzle. Things did not look good for our second target, the Short-tailed Grasswren. After a 2-hr search in moist and cold conditions we were pleased to have had good views of Elegant Parrot but no Grasswren. A coffee break was enjoyed while waiting for the conditions to clear but to no avail. After a further unsuccessful search lunch was had at some nearby ruins in a scenic creekside setting. At the end of the day, after searching for a total of 7 hours, the leader and a number of participants had had 3 glimpses of Short-tailed Grasswrens. We had to give up and headed north, to Lyndhurst. On the way we saw the first Black-faced Woodswallows, as well as number of Australian Ringnecks, which here intergrade between the Mallee and the Pt Lincoln races. It was a clear and cold morning as the sun rose on our way to Mt Lyndhurst Station, where we searched for our 3rd Grasswren species: Thick-billed. One of the first birds we encountered was the Rufous Fieldwren, of which there were a number of individuals singing. We also had our first Chirruping Wedgebills here and a White-backed Swallow. After about an hour of searching we came across a party of 3 Thick-billed Grasswrens that allowed prolonged views as they foraged around a saltbush, at times popping on top of it to sing. Searching the area we twice flushed a Little Buttonquail. On the way back to the car we had good views of a pair of Cinnamon Quail-thrush, another specialty of the area. After lunch back in Lyndhurst we headed further north into the outback, via Marree and on to the Birdsville track. We came across a large flock of Crimson Chats, followed soon by another flock of chats, this time Orange Chats. At Lake Harry, a large, temporary lake on the side of the road, we added a number of waterbirds to the list, including White-necked Heron and the zebra-striped Pink-eared Duck. Banded Lapwings were a nice surpise here, too. Darkness fell as we headed further up the Birdsville track and we had to brake hard to avoid hitting 3 Inland Dotterels on the road! They allowed good views but had gone by the time the second car had caught up. Letting the second car go ahead was a strategy that paid off as within minutes they were looking at a confiding Inland Dotterel in their headlights! Satisfied after a long but bird-rich day everyone enjoyed their meal at the characteristic Mungerannie Pub. Another big day out on the Birdsville track. We set off around sunrise to check a nearby communications tower where in the past Grey Falcon had sometimes been seen. A careful check of this very tall tower revealed Brown Falcon after Brown Falcon… .hang on a minute, what’s that bird hiding partly behind a trestle? Indeed…a Grey Falcon!! Excitement all along as people watch this rarest of Australian raptors through the scope, while cameras were clicking away. After 10 minutes or so it decided it was time to leave, flapped its wings once and flew off… meaning it was time for us to hit the road again in search of other exciting birds. Before we even climbed back into the vehicles though a pair of Gibberbirds had shown up out of the blue! We had a great time observing them as they came quite close to us. And while we were watching them, a small flock of some 15 Flock Bronzewings came racing past, although at quite a distance but tickable views for those that needed it. That’s three top quality birds within 10 minutes! We drove north, spotting occasional flocks of Budgerigars, more Crimson and Orange Chats, and the odd Cinnamon Quail-thrush. Raptors were scarce, with a few Wedge-tailed Eagles, one Little Eagle, and a few more Spotted Harriers; Brown Falcon and Nankeen Kestrel were common, though. The main target of the day was the elusive Grey Grasswren. On the way there we saw a small number of Australian Pratincoles, our first and only for the trip. We reached the site for this bird only around 2pm and everyone was keen to have a crack at finding it, forgoing lunch temporarily. Within minutes we heard, then saw, a pair of Grey Grasswrens! They were sitting atop a lignum bush, allowing prolonged views and photographs. As people were pondering their luck over a picnic lunch on the side of the Birdsville track we had a chance to observe some more mundane species such as Little Crow, Rufous and Brown Songlark. After lunch we went back to the Grey Grasswren site and after an hour-long search we found the birds again, but we couldn’t improve on the previous views as they were skulking inside the bushes, but we did have views of them running from one bush to another. It was time to head south again, back to Mungerannie, but first we stopped at a beautiful site where a small lake (now dry) surrounded by wildflowers was flanked by a pristine red sand dune covered in canegrass. The whole area had a serene feel to it as it was cast in a warm light by the setting sun. Unfortunately last years’ Letter-winged Kite nest was now empty and the birds had left for wetter parts. We did see Diamond Doves, a White-winged Triller and a Horsfield’s Bronze-cuckoo, though. And once we’d started driving south, we saw a number of small flocks of Flock Bronzwings, one of which landed near the road allowing great (and photographable) views! By the time we left there it was dark and still had almost 2 hrs of driving ahead of us… It had been a bird-packed day. Before we arrived back at Mungerrannie, 3 Southern Boobooks and 2 Barn Owl were seen in our headlights. No rest for the wicked: another sunrise visit to the tower where to our amazement we saw 2 Grey Falcons this time! After observing them for a while one flew off and we decided to go looking for Eyrean Grasswren in a nearby sand dune. Again, it didn’t take long to locate a pair, running in typical grasswren-style in between the clumps of Canegrass, and later one popped up on top of a saltbush to sing. With the gibber background this made for great photographic opportunities. While we were on a running streak we tried for Banded Whiteface and sure enough, a group of 6 turned up as on cue! Great scope views were enjoyed by all and we returned to Mungerannie for a combined breakfast/morning tea. Some people observed Blue Bonnets, White-breasted Woodswallows and a Red-backed Kingfisher here. After enjoying real coffee and bacon & eggs rolls we headed south again. Our first stop was at the Clayton Creek crossing where a very confiding pair of Red-browed Pardalote was calling from a small tree. A pair of Brolgas came flying in, to land in the swamp around the creek, while a Little Grassbird was calling from inside the reeds. Further south we spotted more Crimson and Orange Chats and one or two Gibberbirds, while back at Lake Harry, we found 3 Banded Stilts in addition to the other birds that were present two days earlier. We had decided to have another attempt at the Short-tailed Grasswren in the Flinders Ranges so after a late lunch in Lyndhurst we raced south, to arrive at Stokes Hill with just over an hour of daylight left. This time there was no fog or cloud…. but it was blowing a gale and with a temperature of about 8 C it felt bitterly cold. The Grasswrens must have thought the same because apart from one squeak nothing was heard, let alone seen. Once darkness fell we gave up and headed for Hawker, our base for the night, again reminiscing about a great day’s birding. We awoke to light drizzle as we set of in the dark for our last target: Western Grasswren. 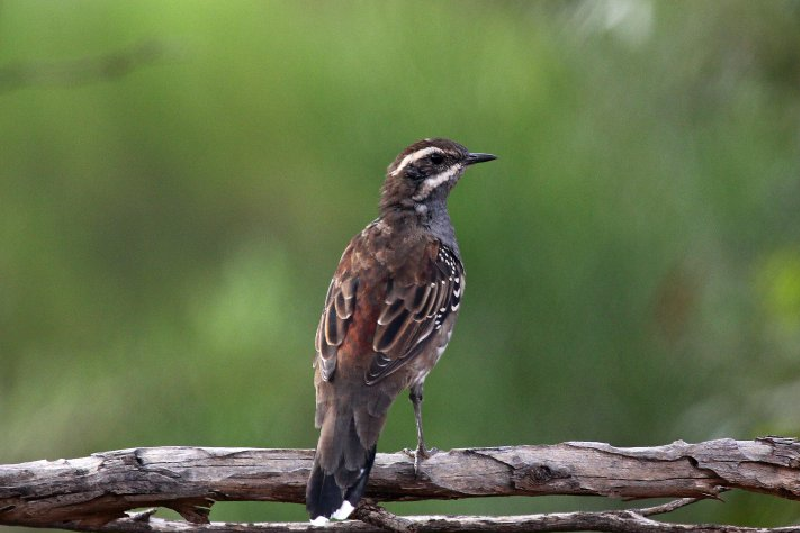 Recently split from the Thick-billed Grasswren, Western Grasswren comprises the textilis race in Western Australia and the myall race in South Australia (west of Pt Augusta). After a slow drive (out of necessity, to avoid kangaroos in the dark) we arrived at a conservation reserve near Whyalla half an hour after sunrise. Fortunately the drizzle had made way for clear skies and cold (close to freezing) temperatures. We rugged up and set off traversing the blue-bush plains where we saw plenty of White-winged Fairy-wrens and a few Blue Bonnets. After an hour’s unsuccessfully searching the plains we shifted our attention to an area around the back of a large rocky outcrop where a pair of Western Grasswren was located, foraging in the same area, but separately to, a flock of White-winged Fairy-wrens. The Grasswrens were observed multiple times, mostly running from bush to bush, or crossing the track, or foraging underneath blue-bushes. At one stage, a Grasswren scuttled in front of an observer’s feet, and another time, someone accidentally stepped on a small bush to find a Grasswren flush out…! Morning tea was well deserved after this success and we easily picked up Redthroat on the way back to Pt Augusta where a flock of 100s of Banded Stilts allowed good scope views. Our next stop was at the Australian Arid Lands Botanical Gardens, where we were entertained by singing Chirruping Wedgebills and confiding Zebra Finches. During a sumptuous lunch here, some of us heard a Black-eared Cuckoo and saw a Mulga Parrot at close range. Our last proper birding stop on the way back to Adelaide was a gorge in the Mt Remarkable Ranges which run parallel to the coast south. The scenery was remarkably different here: rather than the vast reddish-brown stony or sandy, sparsely vegetated outback that we’d become accustomed to, a babbling creek was flowing through a rather lush setting, its banks lined with flowering plants and shrubs and overtowered by green gum trees. It took little effort to locate a pair of Grey-fronted Honeyeaters here which showed well, and to add to the bird list we also had Golden Whistler and Laughing Kookaburra. On the way back to the main road we were surprised by a flock of some 15 Elegant Parrots. On the way to Adelaide it started raining resulting in spectacular views with rainbows over the green fields. At our last stop, in Pt Wakefield, we finalised the bird list, adding some common waterbirds in the process. People were returned to their various destinations in Adelaide early in the evening, tired but satisfied with a successful 6 Grasswren tour!